Banstead Botany Blog: Fly orchid information required please! At this time of year I start looking back on the year and re-examining photos taken, none of which are ever as good as I thought they were at the time! One that caught my eye however was taken not by myself but by a friend and it is a picture of Fly Orchid (O.insectifera). The normal Fly Orchid (above) is a magical little plant, the flower quite different from almost all other species in the Ophrys genus with petals that mean it truly lives up to its common name. We are lucky enough to have a small colony of about thirty plants of this species in Banstead although just a few miles south there are sites where in a good year you can see thousands of plants. However the photo in question, taken at a Hampshire site, shows a plant with a flower (below) with a very obvious yellow edge to the lip, even more attractive than normal. Over the years I have seen this species at many sites in both the UK and mainland Europe and althought the lip size can vary considerably it always has been brown. Both Lang (Britain's Orchids) and the Harraps (Orchids of Britain and Ireland) mention the occurrence of this type of plant as occasional or rare respectively. So I wonder just how rare is it. I should point out that there are two similar species found in S.France and Spain O.subinsectifera and O aymoninii (below) that have lips with yellow edges but this is not they! So, how rare is this variant in Britain, can anyone out there help, i.e. have you seen a Fly Orchid with yellow-edged flowers?? 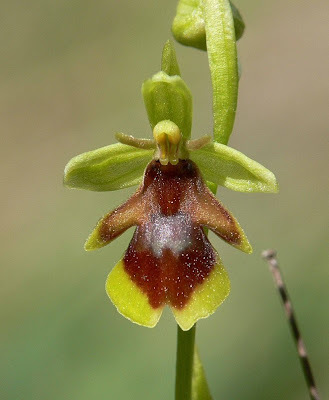 There were certainly 2 plants that flowered regularly at a well-known orchid site in East Kent that exhibited yellowish lip-edges when I lived there between '92 and '03. I've no idea how many Fly Orchids there were in those woods in total, but they were certainly less than 0.5% of the total population. Many thanks for that. So far you are the only other person I have found who has seen one! 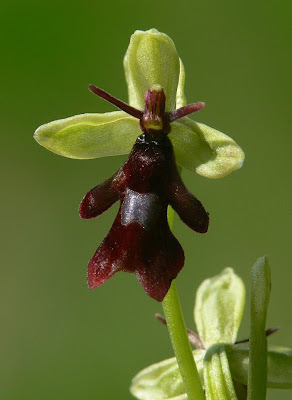 The fly orchid is a unique species that are common in the Mediterranean and some are seen in Britain. I once seen it in an orchid farm in Southern England but this type of orchid is rare. The key to choosing the right Orchids to grow is taking the time to understand what growing conditions they will need. Some Orchids need very bright light, for example, and your home may or may not have bright enough light. Other Orchids, such as Phalaenopsis Orchids, cannot take direct sun on their leaves. That means a Phalaenopsis Orchid needs a shady location 24 hours per day.